Sarah (Susan) Yehudit Schneider is one of our generations’ most unique and vibrant voices. She is recognized by a wide range of Torah scholars, spiritual seekers, teachers and students as an authentic embodiment of Torah learning and living. Her ability to translate abstract and complex concepts into an eloquent and common language as well as her deeply personal and prayerful approach to study, teaching, counseling and living has endeared many to her. Her vital contribution to Torah scholarship, women’s Torah, and the Jewish people as a whole continues to grow daily. 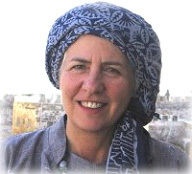 Sarah Yehudit has pursued the study and practice of religion, meditation, and comparative mysticism since the early seventies, and since 1981 has lived in Jerusalem and followed an Orthodox path of Jewish observance. She studied at Neve Yerushalayim where she completed the advanced learning program. She wrote and studied privately with Rabbi Yitzchak Ginsburgh, one of our generations’ most respected teachers of Chassidut and Kabbala. Before immigrating to Israel she received her bachelor’s degree in Molecular, Cellular, and Developmental Biology from the University of Colorado in Boulder and worked as laboratory researcher for Celestial Seasonings Herb Tea Company. She is the founding director of A Still Small Voice, a correspondence school that has enrolled hundreds of students since its inception in 1991. The school provides weekly teachings in classic Jewish wisdom to subscribers around the world. She is the founder of The Golden Thread, a homeopathic remedy based on Torah and kabbalistic sources. Sarah also hosts Meditation Retreats, guiding participants through traditional Jewish meditative practices and instructs them on how to harness the holy lights of Shabbat for healing and transformation. She has recently produced a series of Illustrated Video Teachings on Jewish Meditation that makes these teachings available to a wider audience. They can be viewed in the video section of this website. Sarah Yehudit writes and teaches in close cooperation with leading rabbanim and outreach professionals in Jerusalem. She has written Eating As Tikun, Purim Bursts, Purim Bursts 2, Kabbalistic Writings on the Nature of Masculine and Feminine, Evolutionary Creationism and You Are What You Hate and has published four journal articles in B’Or HaTorah called “The Evolving Feminine”, “Evolution, Form, and Consciousness,” “The Underside of Creative Expression,” and “The Daughters of Tslafchad, Toward a Methodology of Attitude around Women’s Issues.” An expanded version of this last article appears in the anthology, “Torah of the Mothers,” edited by Elper/Handelman, and published by Urim Press. She has also lectured and taught extensively at various institutions and conferences throughout Israel and the US. Sarah Schneider currently resides in Jerusalem’s Old City where she spends her days studying, writing and teaching (both to groups and individuals).